Breakfast is my favorite meal of the day but I admit I do a horrible job making time for it. I have a bad habit of hitting the snooze button on my alarm until there’s just enough time to throw on clothes, splash water on my face, and run out the door. As a result my breakfast often consists of whatever I can scarf down the quickest while standing over the sink to catch the crumbs. I guess you could say that I’m not what most people would call a “morning person”, however I still value a nutritious meal to get the day started off right. Skipping breakfast, or any meal for that matter, is unthinkable for me. The second my blood sugar starts to tank, I morph into a raging monster who’s incapable of accomplishing anything good in the world. So breakfast is definitely a necessity in my book! Because of that, it’s important that I have something healthy and ready-to-eat on hand at all times, like these Spinach and Goat Cheese Mini Quiches. They’re the perfect solution for busy mornings. Each one is packed with protein from eggs, spinach, and goat cheese, plus the almond meal crust which also happens to be naturally low in carbohydrates. It’s based off of my Tomato Basil Quiche and it’s just a mixture of almond meal (which is finely ground almonds), fresh garlic, olive oil and thyme. It almost sounds too simple but trust me it’s delicious. 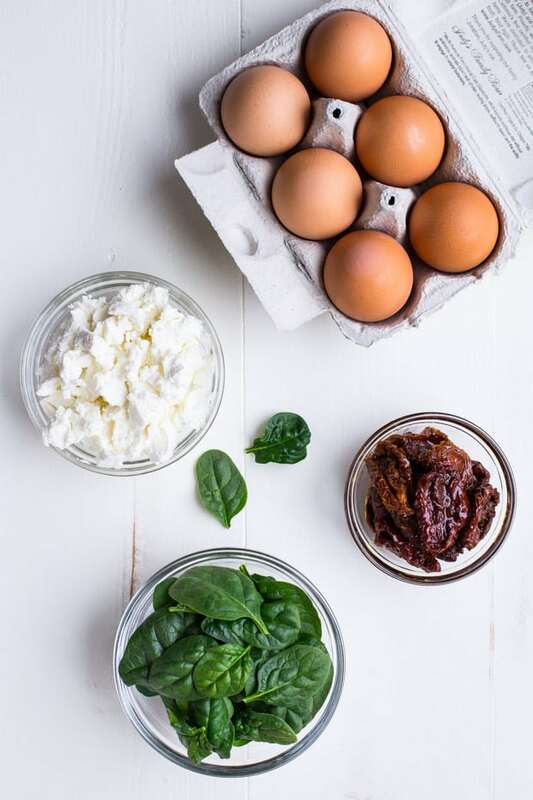 Between the crust, the tangy sundried tomatoes and the creamy goat cheese, they’re flavorful enough to keep your taste buds happy and nutritious enough to give you the energy you need to make it through the morning. And the best part is you can prep them ahead of time and they freeze beautifully. You don’t even need to defrost them. Just pop them in the microwave for 2 minutes and they’re ready to eat! 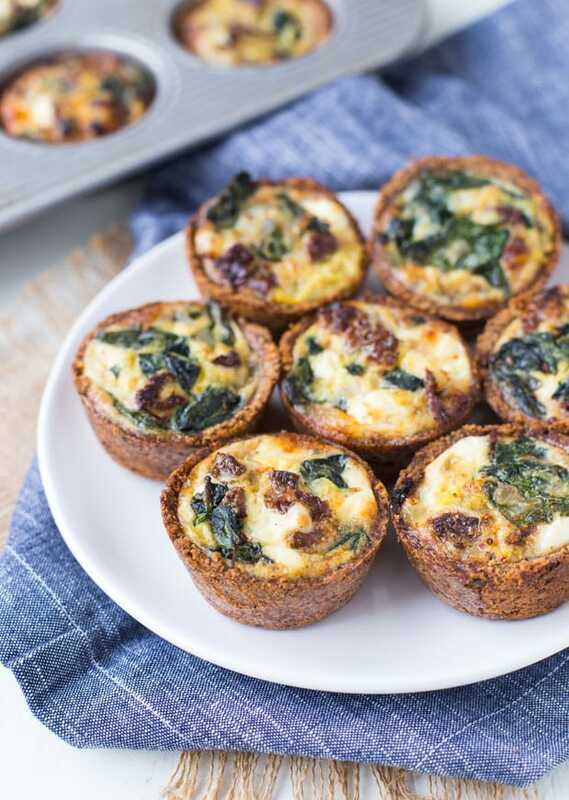 These protein-packed mini quiches can be made in advance, making them the perfect breakfast for busy weekday mornings. Preheat the oven to 400°F, then grease a muffin tin and set aside. In a large bowl, combine the almond meal with the minced garlic, thyme, salt & pepper, and stir together. Pour in the olive oil and the water and stir until a dough forms. Scoop a small amount of the mixture into each muffin tin, then use your fingers to press it down and up along the sides to form a crust that’s roughly 1/4″ thick. Bake in the oven for 10 minutes, until light golden brown, then remove and set aside. Meanwhile, prepare the filling by warming the olive oil in a pan over medium heat. Add the shallot and cook for about 3 minutes, until fragrant. Then add the spinach, toss together, and continue to cook for about 5 more minutes, until wilted. Remove from heat and set aside to cool. In a large bowl, whisk together the eggs, milk and crumbled goat cheese. Add the cooled spinach mixture and the sundried tomatoes to the bowl and stir together. Scoop about 1/4 cup of the mixture into each muffin tin, until all 12 are full. Bake in the oven for 25 minutes, or until golden on top. Cool for 15-30 minutes before removing from the muffin tin. You can use a butter knife to help release the sides as you remove them. Once they have cooled completely, transfer the mini quiches to a freezer safe bag and seal shut. Store them in the refrigerator for up to 3 days or the freezer for up to 2 months. To reheat, simply remove them from the bag and microwave until warmed through, about 30 seconds for refrigerated quiches and 2 minutes for frozen. Pinning this one–it has some of my favorite things. And I’m more of a freezer person than a morning person, too. How can I cook this without the eggs? Hi Gabriel! I haven’t tried making this without eggs so I’m not sure how that would work. But if you tried searching for a tofu quiche, I’m sure something similar would come up! Please fix the print recipe link. Only the title appears. These look amazing! We’re working on it, thanks Diane!